The Virgo Stellar Stream is located in the constellation of Virgo. It is believed to be the remains of a dwarf spheroidal galaxy. This galaxy is in process of merging with the Milky Way. This stellar stream was discovered from photometric data from the Sloan Digital Sky Survey. This data was used to create a 3D map of the Milky Way. Different colors and levels of brightness were used to estimate the distance between the stars. This process uses a method known as photometric parallax. The Virgo Stellar Stream covers more than 100 square degrees and possibly as much as 1000 square degrees. The stellar stream contains only a few hundred thousand stars despite its close proximity to the Solar System. The number of stars in the stream is not as high as it remains in star clusters. 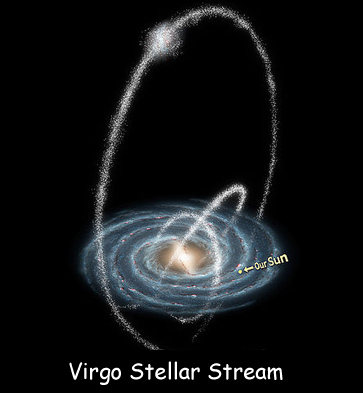 The Virgo Stellar Stream is located within the Milky Way at an approximate distance of 30,000 light years from the Sun. The Dwarf Spheroidal Galaxy (d Sph) is the largest galaxy visible from the earth. The galaxy has a low surface brightness, possibly as low as 32.5 mag/arcmin². The Virgo Stellar Stream also resembles the Monoceros Ring which was found in 2002. This stellar stream has been described as a rather pathetic galaxy. The Virgo Stellar Stream is also known as the Virgo Overdensity or Virgo super star cluster. This stream is close on the plane of the sky to the Sagittarius Dwarf Elliptical Galaxy. Declan, Tobin. " All about Virgo Stellar Stream ." Easy Science for Kids, Apr 2019. Web. 26 Apr 2019. < https://easyscienceforkids.com/virgo-stellar-stream/ >.